New Zealand is a country of stunning and diverse natural beauty: Soaring mountain peaks, fiords, lakes, rivers, and active volcanic features. The islands are inhabited with many species of unique fauna and animal life, including the elusive kiwi, which has become the national symbol. Known as the Adventure Capital of the World, it's no surprise that there's a vast range of activities to choose from; go bungy jumping, hop onboard a jet boat and travel down winding rivers, or enjoy an incredible hike through one of 14 National Parks. New Zealand's majestic mountains also provides world-class skiing and snowboarding in winter. 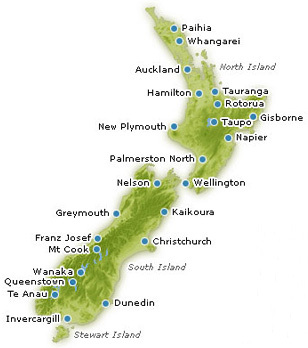 With a range of adventure tours, ski tours, eco-tours, small groups, event tours and independent travel tour options, to name a few of the many opportunities available to the visitor wishing to see New Zealand's scenic beauty, you can check online accommodation availability in the city you want to stay in, check availability and rates from rental car and campervan hire or check seat availability and make instant confirmation reservations for bus, coach, ferry and tours - 24 hours a day/7 days a week from your laptop, IPad, Android tablet, netbook or internet cafe, using our online reservation systems. Once your reservation has been confirmed and paid for, you will receive your 'Booking Confirmation Voucher' or 'E-Ticket/Itinerary' by email for you to print and include in your travel documents.